Buy Nairn's Dark Chocolate Chip Biscuits 200g in the UK from our online shop or directly from our independent Scottish store. These tasty, wholesome, wheat free, biscuits are the perfect tasty biscuit for healthy eaters and those avoiding wheat. No Artificial Colourings Flavourings or Preservatives. Wholegrain Oats (60%), Demerara Sugar, Palm Fruit Oil, Stem Ginger (6%), Dietary Fibre, Potato Starch, Ground Ginger, Partially Inverted Syrup, Raising Agents: Ammonium Bicarbonate and Sodium Bicarbonate, Barley Malt Syrup, Salt. We sell real Nairn's and other Oatcakes & Oat Biscuits directly from our shop in Scotland and online throughout the UK. View more products from Nairn's. Where can you buy real Ginger Oat Biscuits safely online? If you are wondering where you can buy Nairn's Dark Chocolate Chip Biscuits 200g safely online in the UK, then shop with us. 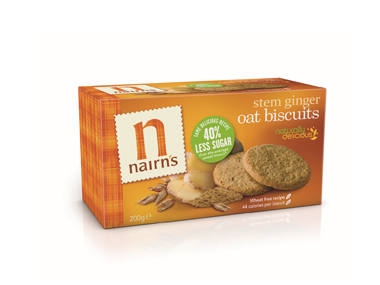 Ginger Oat Biscuits - Nairn's Dark Chocolate Chip Biscuits 200g in Oatcakes & Oat Biscuits and Biscuits & Breads.